Greetings from my Ocean Kingdom! 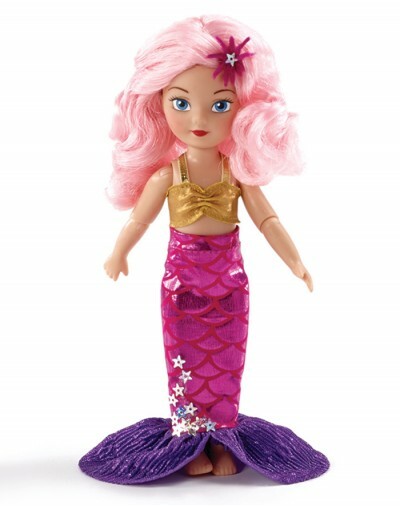 I'm a 7 inch tall Little Mermaid Princess and I spend my time playing with (and protecting!) all of the fishes and other creatures in the sea. I live in a beautiful castle far far below the waves but I like to swim up to the surface and watch the people who walk around on two feet. I'm wearing a gold bikini top and a deep pink shimmer skirt with scales and star pattern and purple "fins" (it's removable so I can transform into human and walk on land for a while!). My hair is a lovely shade of soft pink and I have a starfish hair accessory. I'm extra fun to play with, thanks to my moveable joints at neck, shoulder, elbow, hip and knees. Ages 3+. SKU 70350.